Richard McGrath was already struggling with health problems. The 82-year-old suffers from chronic obstructive pulmonary disease, his daughter said, and then on Thursday, his car apparently skidded across ice in Easton and crashed into two trees, leaving him with a fractured neck and spine and some broken ribs. He needed trauma care at Boston Medical Center, but protesters had shut down northbound Interstate 93 at East Milton Square, and the ambulance carrying McGrath had to turn back and head to Good Samaritan Medical Center in Brockton — a hospital without a trauma center. The two groups of protesters involved in highway shutdowns said they were trying to call attention to what they say is racial oppression, by police and others. The effort began about 7:30 a.m.
Easton Fire Chief Kevin Partridge said firefighters driving the ambulance with McGrath on board were en route to Boston Medical at 8:03 a.m. when they were alerted to the bottleneck created by protesters who closed off the Southeast Expressway. Read: Protests also halt traffic in D.C.
Partridge told State Police that officials decided to divert the ambulance “for fear of the patient expiring if they could not reach Boston Medical Center due to the traffic gridlock created by the parties blocking Rt. 93,” according to a police report. McGrath was transferred from Brockton to Massachusetts General Hospital later Thursday, his daughter said, because he needed a trauma center. He was listed in fair condition Thursday night. 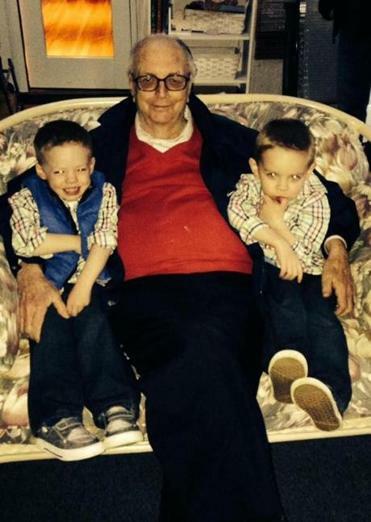 Richard McGrath, 82, with two of his grandsons. Partridge said the single-car crash occurred at 7:23 a.m., and firefighters were on the scene four minutes later. The vehicle was wedged between two trees, and McGrath, a father of seven and grandfather of 15, was trapped inside the mangled wreckage, Partridge said. Firefighters first had to cut down a tree and then extricate McGrath from the vehicle, the chief said. That took about 20 minutes, and McGrath was on board a department ambulance at 8:02 a.m. The diversion occurred about a minute later. Her father is a laid-back jokester who has been married to her mother for about 55 years, she said. “He would give you the shirt off his back,” she said. On Thursday before the crash, she said, her father was dropping her brother off at work. A relative sent her pictures of her father in the hospital, she said, and his eyes were puffy and black and blue, and his forehead was gashed. “He’s kind of frail as it is, that’s why we’re worried,” Nadine McGrath said. McGrath’s granddaughter, Carson McGrath, 19, said she was not angry at the protesters, but that disrupting people’s daily lives can be problematic. “I think the protests are good, but I think at the same time, people like my grandpa who are trying to get to the hospital and couldn’t, that’s a big problem,” she said. 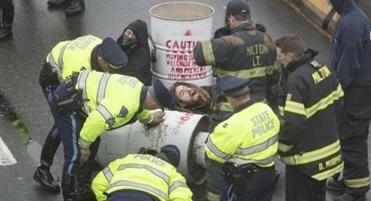 The Easton fire chief said he felt protesters made the wrong choice. A representative of the protesters listed on a statement issued by demonstrators did not return phone or e-mail requests for comment. Nadine McGrath said her family was thankful that her father was still alive, but said she could not understand how a protest about the value of life could put her father at risk. On Thursday night, she said that her father is expected to transfer to a regular room within four to five days, and then probably will move to a rehabilitation facility. The family explained to Richard McGrath that his ambulance was delayed, but he has not formed an opinion. Globe correspondent Catalina Gaitán contributed to this report. John R. Ellement can be reached at ellement@globe.com. Evan Allen can be reached at evan.allen@globe.com.